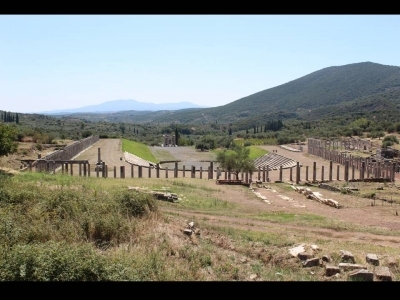 Archaeological site of Ancient Messene is part of the Tentative list of Greece in order to qualify for inclusion in the World Heritage List. I have discovered Messene (not to be confused with the modern town Messini 20km from there) on my way from Mystras to Bassae, in Peloponnese. Messene was founded in 369 BC and became the capital city of the Messenian state for centuries before falling under Roman rule. The archeological site displays an impressive number or structures including fortifications, a 9,5 km wall with monumental gates and defensive towers, a theatre, several temples and an impressive stadium with facilities. The most impressive part of the fortifications (including so called Arcadia Gate) can be seen on top of the hill few kilometers from the archeological centre. To me, the site is one of the main missing WHS in Greece considering the extensive remains and uniqueness of certain attributes such as the monumental fortifications.